Suffering a serious injury can often lead to a substantial period of time away from work and a significant loss of income. Should this be the case any loss could be recovered as part of a successful personal injury compensation claim. A claim for loss of earnings forms part of a claim for special damages which is a term for the ‘out of pocket’ expenses incurred or arising as a direct result of an accident. In addition to special damages, a personal injury claim will consist of a demand for ‘general damages’ which is the label given to the monetary value of pain, suffering and loss of quality of life arising from the injuries. A claim for loss of earnings is broken down into two parts: past loss of earnings; and future loss of earnings. Below is a brief outline of how past loss of earnings are calculated in personal injury cases in Ireland. Our next article will describe how future loss of earnings are assessed. Firstly, it is important to note that compensation for injuries suffered in litigation, including that part relating to loss of earnings, is treated as capital (ie not income) and is exempt from capital gains tax in the hands of the claimant pursuant to section 613 of the Taxes Consolidation Act 1997. In keeping with the rule that a plaintiff is only entitled to be compensated for actual loss suffered, Courts in Ireland award loss of earnings on a net after tax and social charge (or Universal Social Charge) basis. This can result in confusion for some plaintiffs, particularly those who are self-employed, because detailed taxation advice may be required to assess tax on past ‘lost’ income even though no tax is payable on the award at all. If the plaintiff is resident in another jurisdiction whereby tax on that part of an award relating to loss of income is taxable there, s/he may be compensated based on gross income before tax however this would be extremely unusual and expert evidence from that jurisdiction to show that tax would arise on the award would be required. When a claimant is employed, a claim for loss of earnings covers not only basic wages but also any loss of overtime, bonus or shift allowance. Usually, a court will first assess a claimant’s net average yearly income for at least 6 months prior to the accident in order to calculate the average salary. In a straight forward claim the average monthly wage is multiplied by the period of absence (measured in months) and the resulting figure is deemed to be the value of a past loss of earnings claim. In circumstances where using the above formula represents under-compensation – due to the availability of large amounts of overtime during a period of absence or an unusually high volume of sales, for example – comparative earnings of suitable work colleagues during the period of absence could be used in place of a claimant’s average earnings for a period prior to the accident. However persuasive evidence would need to be presented to the defendant and the Court, should it be necessary, that it is necessary to depart from the usual rule in a particular case. Calculating loss of earnings is slightly more complicated for someone who is self-employed. Unlike most employees, self-employed individuals have no guaranteed income and the amount earned generally fluctuates from year to year. Courts in Ireland are extremely reluctant to depart from what is represented in historic accounts and records and this can present difficulties, particularly for self-employed individuals involved in a specialised business with little to no available comparator information, who would have experienced a surge in growth had they been able to work during the period of absence. As a general rule, a self-employed claimant’s past loss of income for any particular year will be calculated by deducting income received in one year (or part thereof) of absence from an average of the annual income that person or business made over a period of between three and five years prior to the accident. If the assessment of loss of income on the foregoing basis would result in an artificially low (or high from the defendant’s point of view) value for past loss of earnings, persuasive evidence would need to be produced to the Court to use an alternative method. If assessment of loss of earnings on any basis is impossible for any case (beit an expert or indeed a judge) a line of case law exists which would permit a Court to award a ‘top up’ of ‘general damages’ having regard to the fairness of the particular case. However, in such a situation expert evidence as to what should/ could be the modified formula for assessing loss of earnings would still be required. If you wish to claim loss of earnings in a personal injury action, make sure your Injuries Board application makes this clear by ticking the relevant box on Form A. Ensure also that you also furnish enough documentation to support your claim, including your past payslips (if employed) and prior year tax returns (where self-employed). If an Authorisation has issued from the Injuries Board in respect of your claim which must now be processed through the Courts, again make sure to include a claim for loss of earnings in your Personal Injury Civil Bill or Summons. Failing to include such a claim for loss of earnings in a Personal Injury Civil Bill or Summons could mean that aspect of your claim is denied. A solicitor could assist you with preparing your application to the Injuries Board and drafting court documents, if necessary, to ensure your claim for loss of earnings is adequately identified at the very outset. 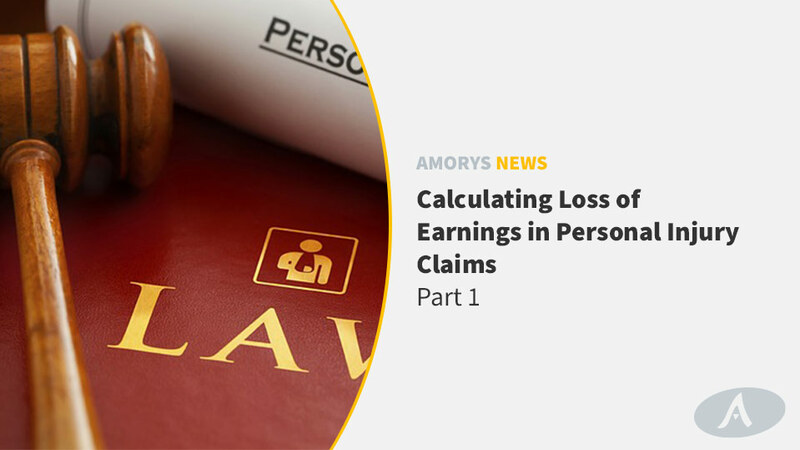 Amorys Solicitors has a wealth of experience in recovering loss of income in serious injury compensation claims and liaising with forensic accountants and tax professionals where appropriate. To begin a personal injury compensation claim or obtain further advice with no obligation contact Deirdre Farrell or your usual contact at Amorys Solicitors by telephone on 01 213 59 40, or email deirdre@amoryssolicitors.com. Disclaimer: the information provided in this article is for general information purposes only and is not intended to be legal advice or relied upon as such. Specific detailed advice is required in every situation.